Now that the Oscar nominations are out, film fans can really decide what to see. 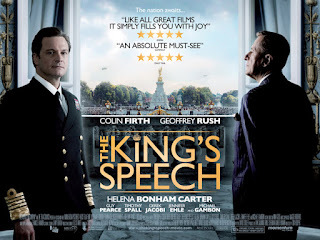 "The King's Speech" has the most nominations with 12; more than Inception (which happens to be my favourite film), Black Swan and even The Social Network. So, with Film, Acting, cinematography nominations behind it, does it really live up to its hype? Is the acting as astonishing as it's made out to be? Is it worthy of all the nominations? Short answer: Yes. "The King's Speech" opens with Prince Albert (Colin Firth) preparing to give a speech at the closing of an exhibition at Wembley Stadium in 1925. Upon trying, his stammer overwhelms him and he embarrassingly leaves. His wife Elizabeth (Helena Bonham Carter) sets out to find a top notch speech therapist, which she does; Lionel Logue (Geoffrey Rush). Albert reluctantly goes to see him, and their relationship as friends starts solidly developing. When Albert's father, King George V dies, his brother becomes King, but shortly abdicates due to his marriage and the country being on the brink of war. This puts Albert as the nest King of England. Preparing for his first wartime speech, Albert nervously waits, hoping to be able to deliver his first successful national speech. I'll make it clear; this film would not work if it were not for the outstanding cast. Every character is portrayed superbly, giving the film its believable nature. Of course, Firth and Rush stand out as the best in the film. They get the most screen time, which is undoubtedly deserved due to their talent. Bonham Carter is nearly as good, pulling off her role intricately as well. All three deserve their nominations, and probably wins, for sure. In my opinion, because Firth, Rush and Bonham Carter are all that good, many other performances are overlooked and are left unnoticed; the main one being Guy Pearce portraying Albert's brother; Prince Edward. He is almost equally as good and he pulls off the role rather nicely. And, of course, it's always nice seeing Ramona Marquez (Karen from Outnumbered) pop up into a film, this time playing Margaret, Albert's youngest daughter. The main thing that surprised me about "The King's Speech" was the surprising amount of humour. Tucked away within the serious, dramatic tone of the film were a good few jokes, mainly one liners, coming from both Lionel and Albert. There were points where the whole cinema erupted with laughter at the comical parts and I found myself quoting some lines the nest day and still finding them amusing. The film can also jump swiftly between comedy and seriousness without you questioning itl which is usually a hard effect to pull off. A good example of where this effect went wrong is "Transformers: Revenge of the Fallen". Of course, being set in the early times of the twentieth century, there is lots to look at. The scenery, the visuals and the cinematography are all perfect and just add to the films many highlights. Being a film about a Royal Family, there are many palaces and mansions involved, and they are all as stunning as the outdoor scenery. 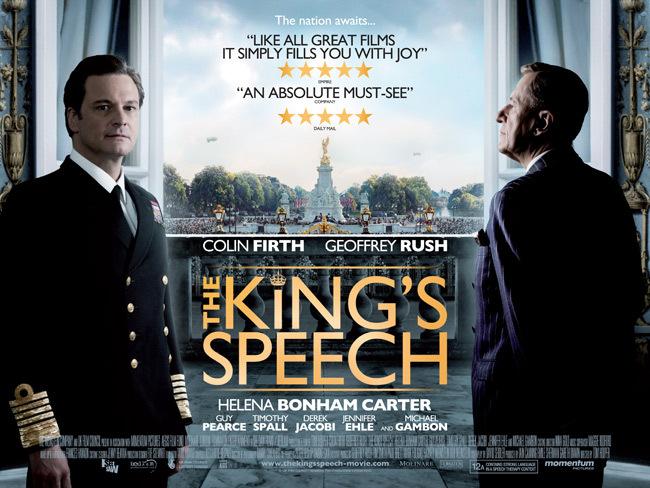 Best Cinematography; yet another award that "The King's Speech" deserves (although I reckon Inception will get it). The best aspect of "The King's Speech", though, is its ability to hold your attention. By the end of the film, as Albert is standing in front of his microphone about to give his long awaited speech, everyone was silent. Not a single noise, no rustling, no whispering; you could've heard a pin drop. Silence. The effect of it definitely pays off, and the ending is very emotional, reducing some people to tears. But were they crying in relief that Albert had got through it, or in sorrow that he didn't? I'm not saying, you'll have to go and see it. Believe me; it's well worth it. To Summarise: Expert performances all round, stunning visuals, good comedy and a heartwarming story make "The King's Speech" one of the best films of 2010, if not all time.